Bizagi provides the user with the possibility to reuse Business Policies and the Vocabulary according to where they were created. The vocabulary can be reused in all of the applications that are part of the project where they were created. Only constant definitions can be defined since there is no context at this level. Global Vocabulary is created only from the Expert View. 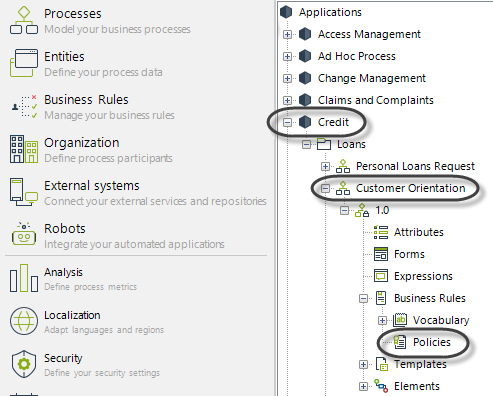 These policies can be reused in all of the processes that are part of the application where the expression was created. They are created only from the Expert View. These Policies can be reused in any of the elements of the process where they were created. They are created from the fourth step of the Bizagi Process Wizard (Business Rules). The following image shows where Application Policies are created and stored. 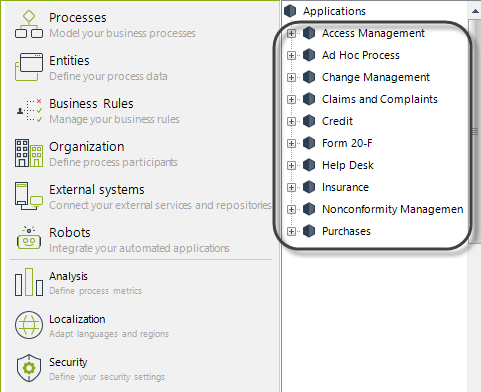 The following image shows where Process Policies are stored. This is how the classification of the Policies will be seen when a Policy is associated to an action of an activity. The policies are organized in families below each type of classification. 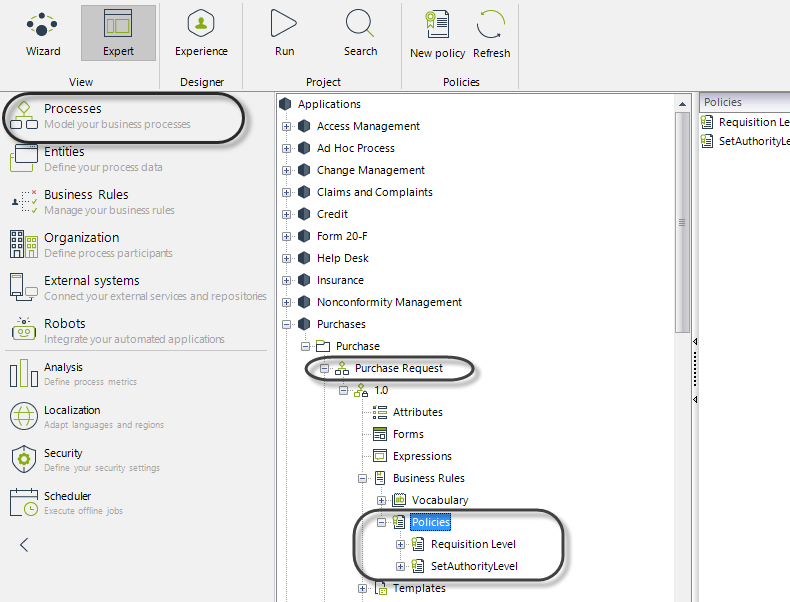 To illustrate how policies can be reused, consider the following project containing ten different applications: Access Management, Ad-Hoc Process, Change Management, Claims and Complaints, Credit, Form 20-F, Help Desk, Insurance, Nonconformity Management and Purchases. 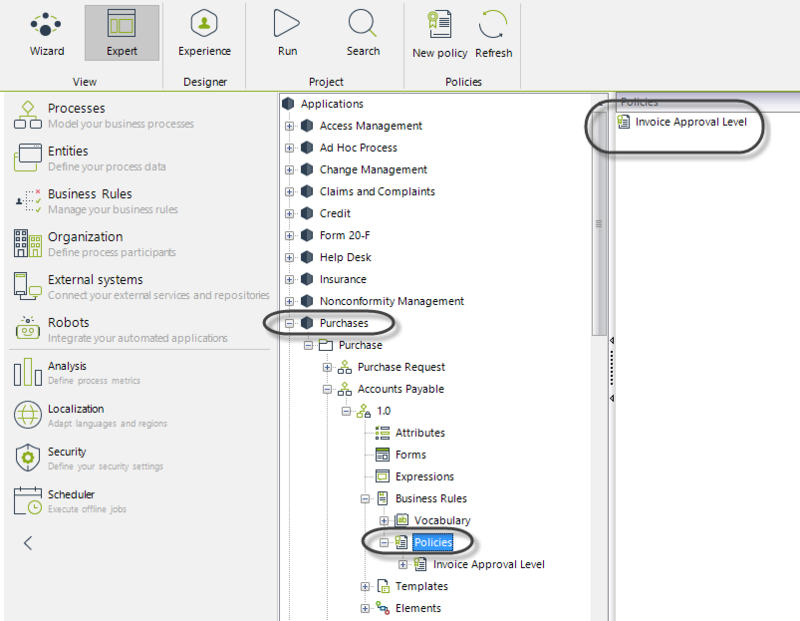 Application Policies created in the Administrative application, can be reused in any of the different processes that are part of the Purchases application (e.g. Invoice Payment, Purchase Requisition, etc.). This Policy would not be available in any process that is part of another Application; for example, the Customer Orientation process in the Credit application. 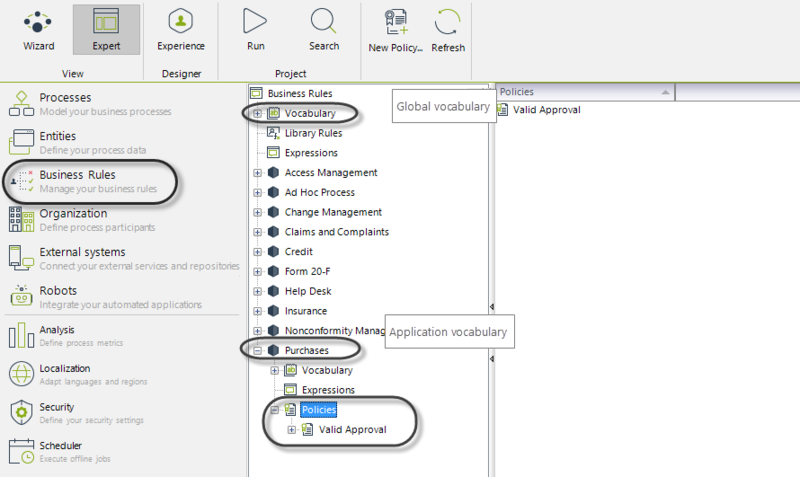 When the user associates a policy to an action of an activity, the Valid Approval Policy will not be listed under the Application Policies. In the Process Policies, we can see that the Invoice Approval Level Policy created in the Accounts Payable process will be available to any of the different activities of the process. The scope of reusability is limited to the Process level. Consequently, they are available as actions to any of the elements of the Accounts Payable process. However, if we go to the Return Invoice to Supplier Sub-Process, the Invoice Approval Level Policy will not be available for reuse.